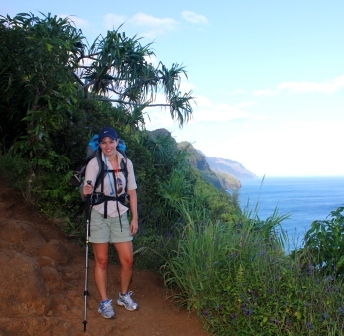 I thought my Kalalau hiking experience would be much different than what it turned out to be. Jeremy and I get up before dawn to head up to the trailhead at Ke'e Beach. We enjoy a beautiful sunrise on the long drive, at this point my stomach is already churning with excitement and anxiety. This map shows the elevation changes of the trail. At the highest peak we are just over 800 ft above sea level. This can not even begin to prepare me for what lays ahead. The first 2 miles of the trail which I have already hiked twice are rocky but beautiful with nice, wide, safe paths. After the 2 mile marker the trail starts to become a little more extreme as does the beauty. The trail varies quite a bit from muddy, over grown, narrow paths to rocky, boulder studded climbs. We finally get to see just a fraction of the challenge before us. At this point we are pretty high over the water. See the red specks to the left of the trees? Those are two person kayaks and believe it or not my uncle is in the front kayak! This picture does not really do the situation justice, first off to the left of where this picture ends the land drops steeply about 300 ft to the ocean. Kauai has had a very rainy summer and as a result some of the trail has been washed away but even the "intact" sections of the trail are no more that 6" wide here. Luckily it is a dry day but that means it is very hot. The dirt is very loose and crumbly making it difficult to get a foot hold and also getting picked up and blown into my face by the whipping wind. The constant switch backs are unnerving (if you look closely you can see some of the switch backs towards the bottom left of the picture), I literally pray my way through but I'm not even close to being finished with the scary part. 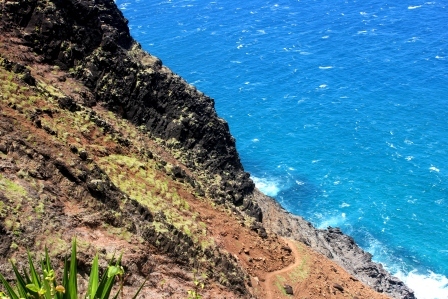 The trail is slightly wider and firmer in this section of mile 7 but after picking my way across the first half of mile 7 at a snails pace, with every muscle tensed and fearing for my life literally every second I am emotionally exhausted and the wind is even worse because the cliffs are steeper and we are hanging further out over the ocean. I stop several times to brace myself against the wind that at one point rips my hat right off my head. I know it is hard to see how steep and treacherous this is from my pictures- which we stop taking as we started on mile 7, we quickly became more concerned with survival (don't forget we are doing this with 30+ pounds strapped to our backs). This YouTube video does a slightly better job of showing the terrain. After the scariest two miles of my life Jeremy and I finally reach a small valley where we rest and I cry. After about 30 minutes I am able to pull myself together and we continue on. Soon after we start hiking again I notice blood drops that continue on for over a mile, I never see who this blood belongs to but this does not help my nerves. 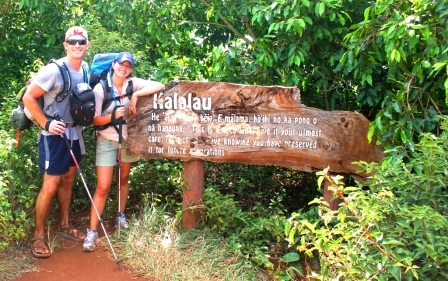 We reach this sign as we enter the Kalalau Valley but we still have a little over a mile before we reach the beach and our camp site. Along the way we talk to other hikers and we hear roomers of a black boat that comes by when the weather and ocean conditions are right to pick up campers that don't want to hike back out. This gives me some hope. We stop at a stream with 1/2 a mile to go to rinse off- my feet are filthy (and super blistered) and I was wearing shoes! The rest of me is even dirtier. At this stream we meet two European guys that have also heard of the black boat and they also do not want to hike back. We set up camp, shower in the waterfall, and eat our dehydrated meal (which is super delicious). We talk to more campers and valley dwellers getting the story with the black boat. 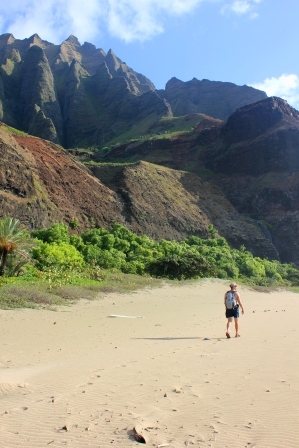 We also hear of the helicopter rescue of a kayaker that tried to come to shore at Kalalau earlier in the day, the surf is very dangerous and he got caught up in the breakers. The man's kayak went over and his hand got tangled in his rudder cable which nearly ripped his thumb off. 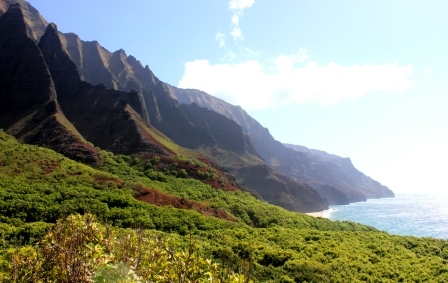 It took three hours for the helicopter to be contacted and make it to Kalalau. As the sun begins to set we see the black boat on the horizon, a group of campers rush into the rough seas with their huge packs, they eventually make their way into the boat which can not come too close to shore because it is illegal for any boat or kayak to come to shore at Kalalau. I am so jealous, Jeremy and I decide we are going to be on the next boat that comes at dawn. We try to enjoy the evening and we strategically pack our bags so we will be ready and be the first people on the beach in the morning- we are not going to miss that boat. 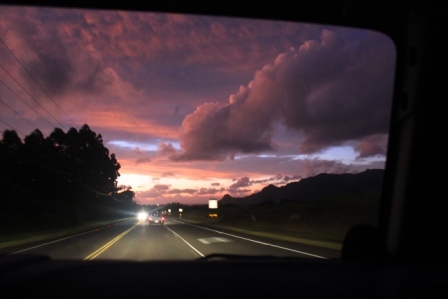 That night I get to see the most stars I have ever seen in my whole life, the sky was beautiful. We are the first people on the beach in the morning. Again our stomachs churn, is the boat going to come? Will we make it on the boat? How will we get past the breakers? Another morning of unknowns. A local came out to prep us and another couple that joined us, thank God, we needed someone to calm our nerves. The black boat arrives and idles just past the breakers, we run into the surf and battle the crashing waves. The girls climb on to the boat while the guys struggle with getting the packs past the breakers. It takes time but everyone is on the boat and we drive off. Everyone is feeling a huge sense of relief and our captain lightens the mood by taking us into caves and pointing out the trail that we hiked which is hundreds of feet above our heads- I can't even see it. We even see dolphins, turtles and a double rainbow on the way back. 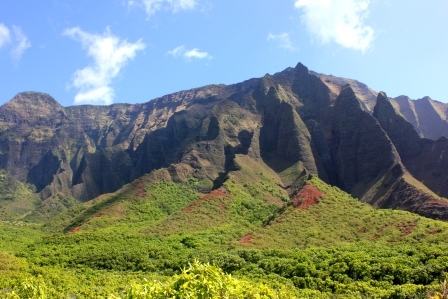 I ask our rescuer who has been a Kauai resident for 20+ years how many times he has hiked the Kalalau- he answers; only once. This was the stupidest and most dangerous thing I have ever done. Do not let anyone you love do it. The trail is beautiful and challenging and the destination is breathtaking, untamed wilderness at it's finest but it is not worth risking your life. That said I am glad I did it, I am proud I toughed it out, now I know I can make it through anything.